I hardly think that the Catholic Archdiocese of Denver had any idea they were holding a service with an uncanonical group, but it is still a sad sight to see the local Catholic bishop exchanging gifts with a man purporting to represent the "Eastern Church" who is not from the recognized Assembly of Bishops roster. Further, I'm told this man is not even recognized by the Kyivans, but do not have confirmation of this. (Denver Catholic) - Days before the feast of St. Gregory the Great, two bishops representing Eastern and Western Christianity expressed their friendship in two separate liturgies and acts of gift-giving. The encounter began months back when Orthodox Metropolitan Archbishop Alexander contacted Archbishop Samuel J. Aquila of Denver saying he wished to give him a first class relic of St. Gregory the Great, known in Eastern Christianity as St. Gregory the Dialogist. The gift was a sign of his personal desire for friendship with the Roman Catholic Archbishop. St. Gregory the Great was Pope from 590 to his death in 604, and is considered a saint in the Catholic Church, Eastern Orthodox Church, Anglican Communion and some Lutheran churches. He is a Doctor of the Church and is also considered an Early Church Father. His feast day is Sept. 3. Archbishop Alexander presented the relic and an icon of St. Gregory the Great to Archbishop Aquila during an Orthodox Divine Liturgy Sunday, Aug. 30. The liturgy was at the Orthodox Cathedral of the Resurrection in Denver. Both Orthodox and Roman Catholics attended the liturgy. During his homily, Archbishop Alexander asked the faithful to ponder the meaning of holiness. 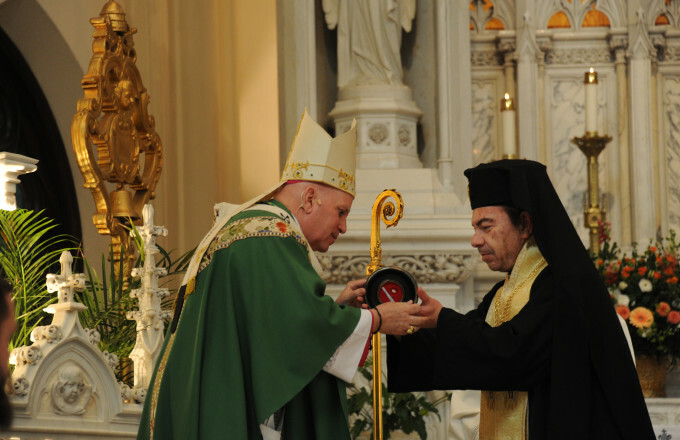 He then presented the relic to Archbishop Aquila. After the liturgy, the clergy and faithful met in the cathedral’s gathering room for a reception. At 12:30 p.m., Archbishop Aquila celebrated Mass in the Cathedral Basilica of the Immaculate Conception, during which he received the relic and the icon. He then presented the Orthodox Archbishop with a statue of Our Lady, known in the Orthodox Church as “Theotokos” (loosely translated to mean “God-bearer”). “I pray for her intercession for you and your community,” Archbishop Aquila said. Archbishop Alexander was not representing the entirety of the Ukrainian Orthodox Church, but rather was demonstrating his own personal desire for friendship. Archbishop Aquila accepted, saying they shared a mission in bringing Christ to the people of Denver. “I pray that our bonds will continue to grow,” he told Archbishop Alexander. After the Mass, the faithful were invited to venerate the relic. Behold the dangers of the Great Pan-Heresy of Ecumenism. Next thing you know Patriarch Bartholemew and Metropolitan Zizioulas will be liturgically dancing "Walk Like an Egyptian" with ISIS. There are difficulties in how the Roman Catholic archdiocese handled this and DEFINITELY in the reporting of it in their newspaper. However, it's not that surprising, since the Catholic Church has ecumenical contacts with lots of bishops and "bishops" that are non-canonical... like Episcopalians, Methodists, Lutherans. This would be like an Orthodox bishop holding an ecumenical prayer service with "Pope Michael I of Kansas". It's not just a simple matter of "one uncanonical bishop is the same as another". This guy Alexander is completely off the reservation...and not because he is making overtures toward Rome. Just ceteris paribus. I'll give you a less ridiculous example. What if Orthodox bishops started courting the bishops of the SSPX? I simply cannot get why would the Orthodox tell the Catholics who they are supposed to dialougue with. It's not our business. It very much is if you want Catholic-Orthodox dialogue to be effective. What if PepsiCo wanted to have a business meeting with Coca-Cola but instead met with some fake con men? Would Coke be like, "I can't get why we would tell Pepsi who to have their business meetings with..."
The average RC bishop isn't intelligent enough to understand the world of Orthodoxy. Heck, this bishop probably thought that Ukrainian bishop was part of the UOC-USA (the one under the EP). Heck, they can't even get the Eastern Catholic churches straight 80% of the time! "It very much is if you want Catholic-Orthodox dialogue to be effective." I do not care about it. Nor do I care about Moscow's hurt feelings. What is the full name of Orthodox Metropolitan Archbishop Alexander? Which jurisdiction is he with? I have not read anything on http://uockp.net/ about a visit of an Archbishop to the USA? Or about a parish in Denver. There are pictures of all the Archbishops here: http://uockp.net/bishops.html You can see there is a picture of an Archbishop Olexander Bilotserkivsky listed but he does not look like the Archbishop in the picture. Very confusing. Maybe if the orthodox didn't have such a confusing system of schisms and separations this wouldn't happen.